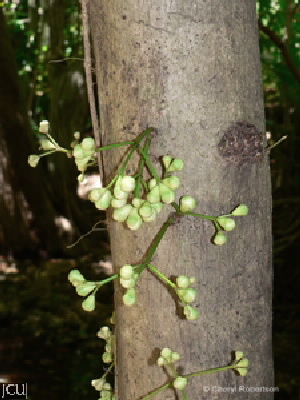 This tall rainforest tree has firm leaves to 21 x 11.5 cm; flowers are borne on the trunk and branches hence these often appear ‘bumpy’. Flowers have white petals and the white stamens are up to 3 cm long. Fruit fleshy, more or less globular about 3-6 cm diameter, calyx lobes persistent.